Shooting is, perhaps, the one sport where tradition has been carried down throughout the years. It is as similar today as it was at the beginning of the 20th century. Early leather gun cases are desirable to collectors for displaying period sporting guns. Leather gun cases that retain original makers' labels such as Wesley Richards, William Powell or Purdy, etc, command higher prices for authenticity. Many of the traditional leather gun cases are available as well as the "leg o'mutton" style gun cases that were popular at the turn of the century. 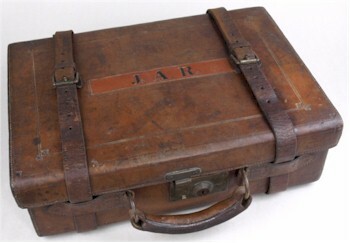 A Boss & Co stitched leather ammunition case, which sold for £300 in one of our sporting auctions. One of the most common items to be found in our sporting sales are copper and brass-powder flasks and copper-shot flasks. Prior to the modern breech loading sporting gun, muzzle loading required the use of shot flasks and powder flasks in order to load. From the 17th century up to the end of the 18th century, many powder flasks were made from horn with simple stoppers. Many were of plain form and fetch £100-£200 at auction, while some with carved or inlaid decoration can fetch £300-£500 depending upon quality. At the beginning of the 19th century, horn powder flasks were replaced with copper and brass powder flasks for which more elaborate decoration was employed. Smaller powder flasks for pistols had similar decoration of militaria and shell-form to their larger counter parts. These smaller powder flasks are sought after by collectors looking for original accessories for cased flintlocks, etc. Prices at auction range from £20-£30 for a plain copper shot flask through to £100-£200 for one with quality decoration that is in good order. Leather cartridge cases and cartridge belts, along with game bags and game carriers, are also popular with collectors. A good quality leather cartridge case will easily attract interest at £200-£300 at auction. Shooting sticks, walking sticks and walking canes come in various styles and materials. There are many Edwardian walking sticks of simple design with silver ferrules available at auction for as little as £40-£60. Victorian walking canes and walking stick tended to be more elaborate displays of wealth, embellished with horn, antler or ivory handles. A simple, uncarved ivory-handed walking stick will attract £100-£150 at auction. Carved ivory and novelty walking sticks have greater interest and auction values start from £250-£300 upwards.